We love beetroot and we sure don’t get enough! We must admit we’ve been a little lazy with our vegetable choices and we’re sick of the same old veggies! We’ve made a list of 5 under rated veggies here and our plan is to start eating more of these! The first recipe is this Paleo Beetroot Hummus YUM! We had it with our paleo crackers! If crackers aren’t your style, why not try plantain chips or wait… smother it all over our low carb high protein paleo bread. Crazy delish factor! ps. 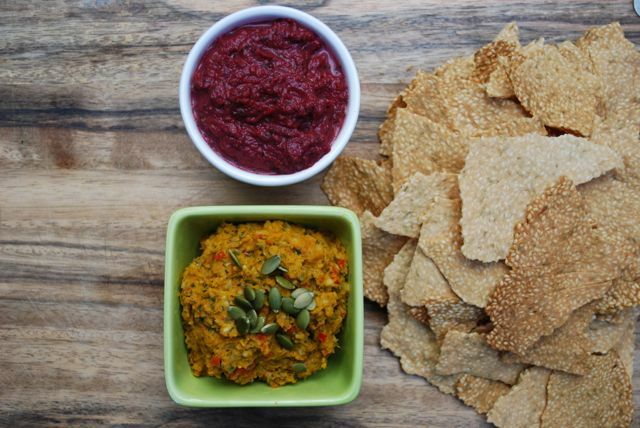 we’d love to see some delish pics of this Paleo Beetroot Hummus on Instagram and Facebook. Be sure to #TheMerrymakerSisters so we don’t miss a single pic! Yay! Yay! Yay! Woo! In a food processor (we used our Vitamix), whiz all ingredients until a smooth, but chunky dip forms! YUM! Serve with paleo crackers or sweet potato chippies and nom nom nom!